When you collect too many items on your clipboard, you might get an error that says your clipboard is full. Here’s how to empty the clipboard. 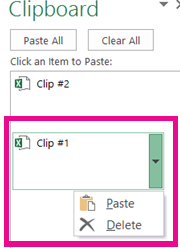 To delete all clips or an individual clip, first open the Clipboard task pane. On the Home tab, in the Clipboard group, click the Clipboard dialog box launcher. 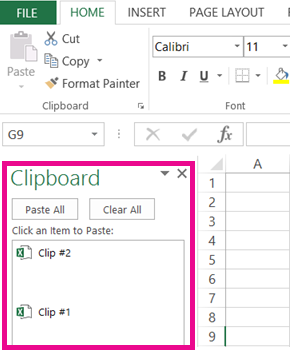 The Clipboard task pane appears on the left side of your spreadsheet and shows all clips in the clipboard. To clear the entire clipboard, click the Clear All button. To delete an individual clip, hover next to the clip, click the arrow to the right of the clip, and click Delete.